Over the years, our student’s performance have strengthened as we remain passionate about their future and are always exploring and investing in new approaches that will allow us to innovate and improve. Our focus for the future lies in enhancing our curriculum and equipping our students with the skills, knowledge and discipline necessary to be successful in an ever more competitive world. We invite you to join us as we work together in developing responsible and an all rounded child through academic excellence. The child’s brain growth can be thought of as “explosive” in the first 6 years. At Vista Cemerlang, we recognize this window of opportunity and the importance of enriching their experiences and life during this period. By creating an environment of discovery, adventure, challenge and excellence, we bring out the best in our children. We strive to take them through a multi sensorial approach to learning, created specifically to stimulate their brains and stimulating neural pathways. 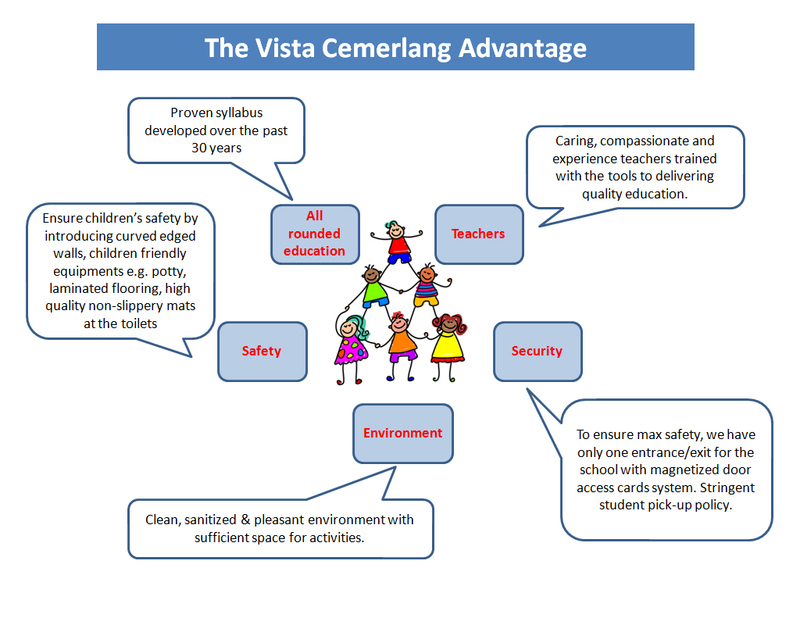 Through observation of our children over the years, the Vista Cemerlang programme has been crafted to bring out the best in their abilities. This gives them the right balance of skills, knowledge, emotional stability, social tools and confidence to excel at the primary school level.